A tranquil historic hideaway, Plum Cottage sits in beautiful gardens on the site of the ancient Priory behind the church in the conservation village of Llangennith. Old stone walls, beamed ceilings and contemporary touches provide the perfect holiday/romantic retreat for couples. The Cottage is 20 minutes walk from the famous Rhossilli Bay and Gower Coast path and there are numerous countryside walks in every direction. 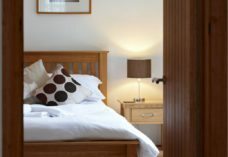 Although conveniently close to the Kings Head village pub, which serves great pub grub and hosts regular live music, and the popular PJ’s Surf Shop, Plum Cottage and it’s private garden evoke a feeling of truly being away from it all! We have many birds visit including Swallows and House Martins and birds of prey can be seen soaring close by. It’s an hour or so to walk to the Britannia Inn and Cwm Ivy nature reserve in Llanmadoc and the Gower Explorer bus service allows an alternative way of seeing Gower and is handy for walkers who want to return after trekking out. Walks to Rhossilli can be interspersed with refreshments at Eddy’s Cafe Bar Llangennith and The Bay Bistro boasting beautiful views of Rhosilli Bay. Perfect Gower cottage for a romantic retreat. Patio area with table & chairs. Suitable for one or 2 children on specific request. Church and Village Hall holding events. Gower Explorer bus stop close by.